This is a Ridge-Line Trail Cage for Deadbolt. 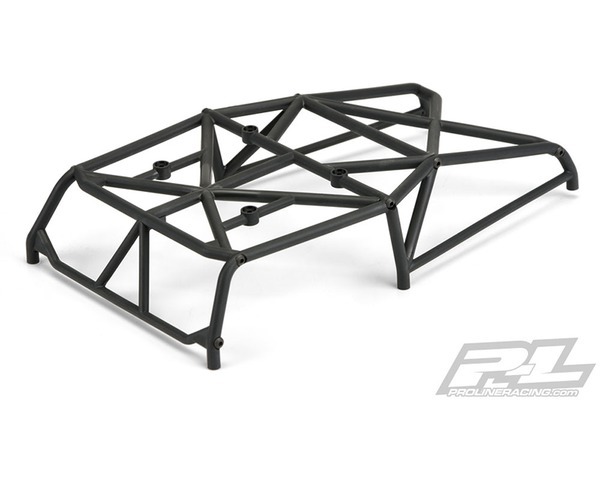 Introducing the brand new Ridge-Line Trail Cage that fits Pro-Lines 1966 Ford Bronco (3488-00) and the SCX10 Deadbolt! The Ridge-Line Trail Cage features a unique scale welded tube frame look that will separate your truck from the crowd. Molded into the cage are mounting locations to fit Pro-Lines Overland Scale Roof Rack directly onto the roof as an option, which opens up the opportunity to mount Pro-Lines 4 LED Light Bar Kit for a fully integrated factory look! The Cage comes with all of the hardware necessary for assembly and mounting. Get your own Ridge-Line Trail Cage for Deadbolt today!